A band from Cleveland Heights/Ohio with their lone release. They had also one track on a Cleveland compilation called "Pride of Cleveland". The b side is a killer tune ! The a side is more pop but not bad. Thanks for posting this; great to have. 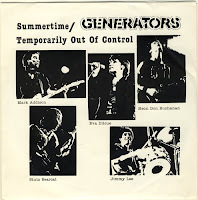 The Generators did one other single, Turn off your TV set/Things fall apart. Also a stronger B-side. But the video of TV set on youtube is great.